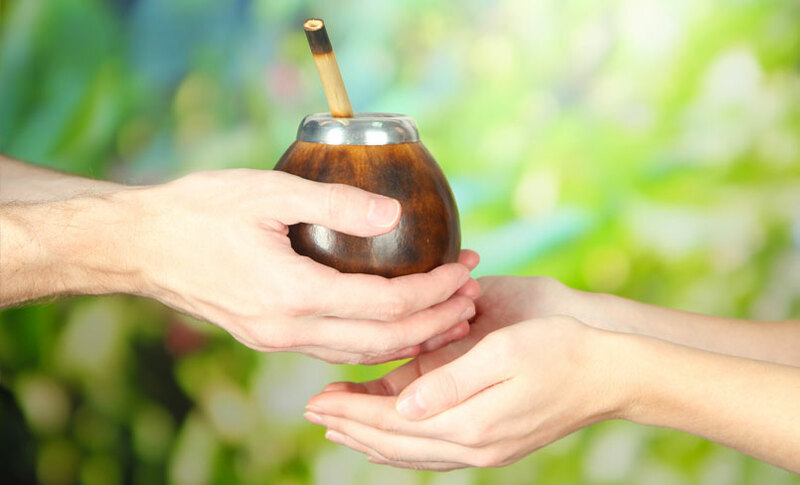 Not only is yerba mate a delicious beverage that is great for bringing people together, it is also amazingly healthful and naturally provides the body with numerous valuable benefits. For starters, yerba mate is naturally caffeinated, making it a healthful alternative to coffee. Yerba mate usually contains about 27mg of caffeine per serving (for comparison, coffee has about 85mg per, while black tea has about 40mg, and green tea has about 40mg). Yerba mate also contains other naturally energizing and mood improving compounds like theophylline and theobromine. However, unlike coffee, energy drinks, and other caffeinated (and often sugary) beverages, yerba mate energizes without causing unpleasant jitters and provides increased alertness without any crashes later. Yerba mate offers long-lasting, balanced energy and focus. Yerba mate’s energizing properties also increase physical stamina, making yerba mate a great choice for athletes. Yerba mate is also packed with powerful antioxidants and polyphenols that naturally defend and fortify the body in a large variety of ways. For instance, antioxidants like those in yerba mate help slow cell aging and degeneration, thereby strengthening the body against damage. Antioxidants also help prevent cancer cells from growing and reduce the risk of cardiovascular disease, heart attack, and stroke. Furthermore, the polyphenols in yerba mate can help strengthen the immune system to improve overall health and wellness. Additionally, studies suggest that the polyphenols in yerba mate also improve sleep, increase metabolism, and reduce allergies. Yerba mate is also packed with 24 vitamins and minerals. These include powerful B vitamins (B1, B2, B3, and B5) and B complex which help the body process food, and stay energized. The B vitamins in yerba mate are also important for maintaining healthy muscles, skin, and hair. Yerba mate also contains vitamins A, C, and E. The vitamin A in yerba mate is critical for good eye health and promotes cell growth and a healthy immune system. Meanwhile, vitamin C improves heart health, is great for the skin, and helps protect against disease, and Vitamin E is a powerful antioxidant that improves circulation and helps the body repair tissues. The minerals in yerba mate include potassium, which is critical for good heart health, and magnesium, which helps the body synthesize proteins. Other vital minerals in yerba mate include calcium, manganese, iron, selenium, phosphorus, sulfur, and zinc. Yerba mate also contains biotin—which promotes healthy nerves and bone marrow and is great for skin and hair—as well as choline—which improves liver and gallbladder health and aids in the production of important hormones. Additionally, Yerba mate supplies the body with 15 amino acids; without amino acids, the body cannot build proteins which are a crucial part of all the body’s cells. Additionally, yerba mate is known to improve digestion, to help lower cholesterol, and to encourage weight loss. The saponins (powerful phytochemicals) in yerba mate stimulate the immune system to protect against disease and may help reduce the concentration of LDLs (bad cholesterol) in the blood and prevent excess them from being absorbed by the body. Moreover, yerba mate is a natural appetite suppressant, and it may even help the body burn more fat to aid weight loss. Yerba mate also prevents the growth of bacteria in the mouth to fight and protect against bad breath. Known by some as “the green tea of South America,” yerba mate is more than just another tea (in fact, it isn’t tea at all). Yerba mate does contain many of the same healthful compounds as green tea, but yerba mate is even more nutritious and offers a wider range of valuable health benefits, so drink up!